The Treasurer work under DPMS is defined in this link. In the old system, Treasury Module had Cash to Postman and Cash from Postman options. But in CSI, we have the same options on the DPMS screen itself. Once the supervisor verifies the EMOs amount, the treasurer can give the amount to postmen by using this link. 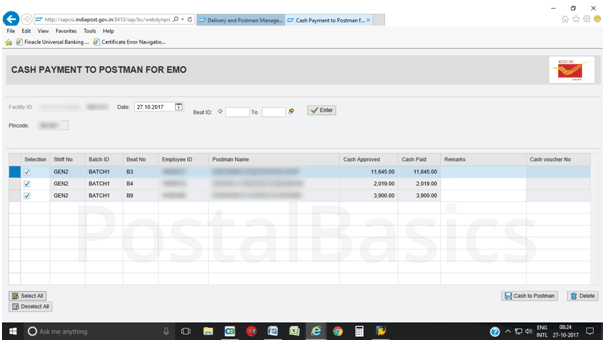 Click on the link Cash Payment to Postman for EMO. The below window will open up. The amount for all postmen gets fetched. Confirm the amount first, then select all and click on Cash to Postman button. Now, a Cash Vouchure Number gets generated. In the previous postman package - when the postman completes his beat delivery - he first submits the money of any CoD(Cash on Delivery) article, EMO unpaid amount, VPP/VPL or unpaid article amount to the treasurer. Later, Despatch PA will take the returns of the articles and supervisor will perform Submit Account for tallying the account. In CSI, some alterations have been made. First, PA will take the returns of the article/EMO, then Supervisor will perform the EOD (Submit account). After the EOD, the treasurer will perform the below work i.e Cash from Postman. Click on the link, Cash from Postman. The below window will appear. Select the beat ID and click on Enter button. Whatever the amount is given by the postman gets fetched. Confirm the amount and click on Receive Payment from Postman. The fetched amount will be added to the TCB. 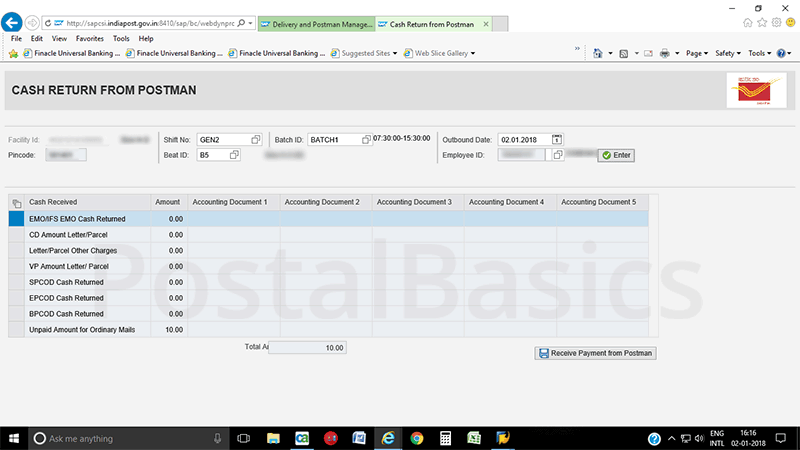 This is how you can perform Treasury DPMS Process. Thanks for reading. Subscribe for more.